Phetchabun Rajabhat University is increasing morality, intellectual wisdom and local development. Phetchabun Rajabhat University is located 3 kilometres away from Muang City on the highway leading to Saraburi – Lomsak. It was originally founded under the jurisdiction of the Ministry of Education as Phetchabun Phetchabun Teacher College on September 29, 1973. The campus covers area of 584 rai of land. In 1976 the collage offered first 2 year diploma, while the Bachelor of Arts and Science Degree were offered in 1985, to serve the growing needs of the community. On February 14, 1992 the college was conferred with the new name, “Rajabhat Institute Phetchabun”,by His Majesty King Bhumibol Adulayadej. In 1995 the Teachers’ College Act 1992 was revised as the Rajabhat Institute Act. The revision resulted in changing the status of the Teacher Education Department into the Office of the Rajabhat Institute Council (ORIC). The 36 teacher’s colleges officially became Rajabhat Institutes. 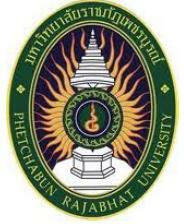 In 2005, The Rajabhat University Act signed by His Majesty, was officially converted to the Phetchabun Rajabhat University. 1973 Phetchabun Teacher College was founded. Produce the quality of students with knowledge, practice skill, morality, good behavior, and to be a good civil for response the need of community and country. Study and research for new benefit knowledge to sustainable local and environed development. Academic service, development, transferring information technology to community and continue the royal project which cooperative among university, community, local organization and other organization in Thailand and other countries in order to be a central local developing organization. Preserve art and culture promoting suitable attitude for up to date knowing, can adjust the social and cultural changing and remain the Thai style with be proud of Thai.